The connection between muscle gain and weight loss is probably one of the most misunderstood aspects of health and fitness. Adding muscle to your body helps you to lower your body fat percentage in a variety of ways; however, these effects are often indirect and can be confusing. With a little bit of straightforward information, you can connect the dots between muscle gain and weight loss and increase your results (and your motivation to exercise). Before beginning any new exercise regimen, consult your doctor. Some fat is necessary since it cushions your internal organs, helps you to assimilate vitamins and stores energy for use later on. Many individuals have a body mass index that is higher than 24. A body mass index of 25 to 29 means you are overweight, and 30 and above puts you in the obese category. Too much fat hides your muscle and gives you a soft, shapeless appearance. Fat does not burn calories; it stores them. Pound for pound, fat takes up more room than muscles, which increases your overall size. Muscle gives your body its strength, shape and definition. It's also very metabolic, since each pound of muscle can burn up to 50 calories per day. The more muscle you have on your body, the more calories you burn 24 hours a day, seven days a week. In this way, adding muscle to your body through resistance training helps you to become a higher-calorie-burning individual. This helps you lose weight that is fat without sacrificing muscle gain. During weight loss, you want to lose the fat and keep (or even add) muscle. The best way to accomplish this is to have a small, daily calorie deficit of approximately 300 calories, add in resistance training exercises three or four times a week and perform cardiovascular exercise 150 minutes per week. 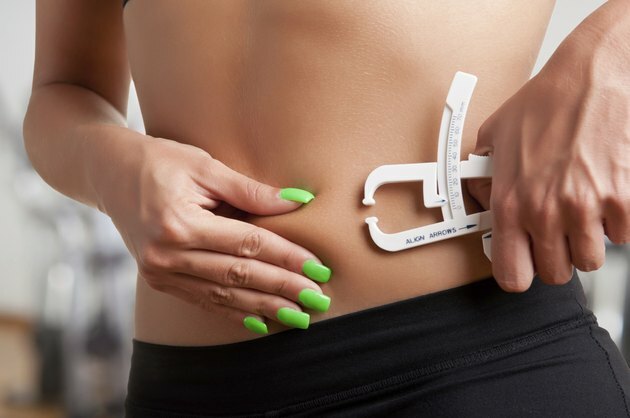 It takes a 3,500-calorie deficit to lose one pound of fat, so this combination should give you a steady weight loss of approximately two pounds per week. Again, don't start this or any new regimen without first consulting your doctor. The ability to gain muscle and to lose weight varies from person to person depending on their genetics. Some individuals are naturally predisposed to put on muscle easily, while others may have to work harder at it. The same goes for how you lose and gain fat. Learn about your body type and use exercise techniques that work with your body and personal fitness goals. This is best done with the help of a professional trainer, after consulting your physician. ACE: Summer Dilemma: How Can I Tell if I Have a Weight Problem?